Rain World casts you in the role of a slugcat, a creature that has the front end of a cat and the tail end of a slug, but moves more like a ferret. At the start of the game you become separated from your family of slugcats, and your ultimate goal is to find them again. In the world of Rain World, slugcats sit somewhere in the middle of the food chain which leaves you dividing your time between finding something to eat and avoiding being eaten yourself. The latter exercise is obvious from a gameplay perspective; all of the various would-be diners are your enemies in the game and there is a menagerie of odd creatures with a variety of unique ways to instantly turn you from a slugcat into a snack. You'll need to eat as well to ensure your own survival, but the reason isn't as straightforward as you'd think. 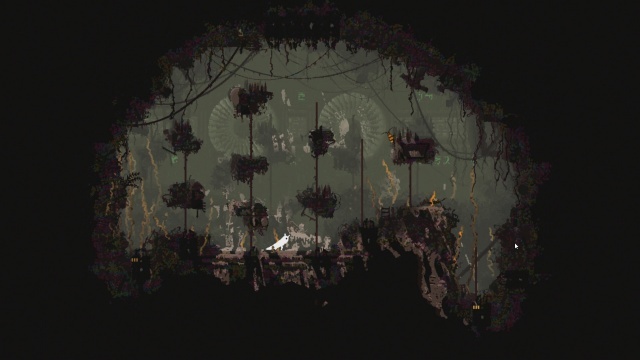 The rain that gives Rain World its name is deadly, and getting caught in a downpour is fatal. The only way to survive is to find shelter from the storms - caves with small entrances that will keep both the rain and any floodwaters out. The storms last a while, and while they do your slugcat will hibernate until the danger finally passes. This is where the food comes in - if you haven't eaten enough food to last you through your slumber you won't outlive the storm. The driving cycle in the game is find enough food to eat and discover safe shelter before the next storm comes, ride out the storm in the shelter, and then emerge to do it all over again. The shelters also serve as the game's checkpoints, so if you manage to die, and managing to die is quite an easy task in this game, you'll be returned to the last place that you hibernated, and it will be as if the last day never happened - even the new areas that you discovered will disappear from your map. Finding out what you can eat and what wants to eat you is also part of the gameplay, and the answer to this question isn't always obvious and has to be learned the hard way. Learning this lesson is something you'll do over and again, as if your slugcat is newly born into its world and knows about as much as you do about it. This learning about the world through trial and error extends beyond the food chain to other aspects of play. The game gives you the barest of tutorials when you start out and then leaves you to figure out everything else on your own. In some ways this is an interesting aspect of gamepaly, leaving you to discover that you can use a stick both as a spear to capture your dinner or to stick into a wall to provide you with a step up that will get you up and over it. In others it can leave you lost and frustrated, unsure of what you need to do to survive or proceed. Seemingly aware of its tendency to be obtuse, the game provides you an odd guide in the form of what looks like a sea cucumber that periodically pops out of the ground to point you at something. Unfortunately, a good portion of the time you won't be able to discern what it's trying to tell you, which results in a tendency to try and ignore it. Rain World is a difficult game - not just because it hides too much information from you, but because its controls are not up to the tasks of puzzle-platformer style room traversal and dodging ravenous monsters. Jumps and landings are finicky, leaving you endlessly guessing if you failed to reach a certain spot because the controls were a little off or because it was actually unreachable. And the slugcat has a big affinity for holes, understandable perhaps given the circumstances of its world, which gives it a strong tendency to push itself into a hole whether or not you intended to do so. If it's a hole leading to a hibernation cave or the next screen it's primarily annoying, but if it happens in other circumstances it can be deadly as they make for nice traps that make you easy prey for a hungry pursuer. It's strange that Rain World controls so poorly, because just to look at you'd have no idea. The animations are smooth and life-like, and if you were to just watch the slugcat move across the screen you'd be impressed with its graceful movements. Overall, the visuals are what I like best about Rain World, it weaves a fascinating and unique world that begs to be explored, and it's a shame that in practice it is rather difficult to do so. There's another obstacle to exploration in addition to the control issues and difficulty. The game tracks your deaths between hibernations through a factor it calls karma, and makes you pay for not doing well by impeding your progress. Gates will bar your way from proceeding to a new area, and the only way to open the gate is to generate enough karma to do so. In order to move forward you'll have to essentially grind karma by successfully eating and hibernating without dying while doing it. It is frustrating to reach a point at which you're barred from continuing because you suffered too many cheap deaths at the hands of the game. Rain World's unique look, atmosphere, and world are intriguing, as are some of the ideas behind its unusual style of gameplay. However, there's a lot to the game's mechanics and execution that aren't implemented well. If you spend a little time with Rain World, you'll find the wonder and fascination that you had at the start of the game quickly melting into total frustration. Final Rating: 60% - The magic quickly washes away.